Metal Gear Solid HD Collection promises a LOT of gaming for you money. 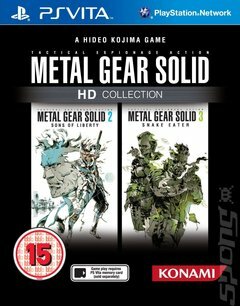 Not only does it feature remastered versions of MGS2: Sons of Liberty, MGS3: Snake Eater and MGS: Peace Walker, it also comes with conversions of the original Metal Gear games as released on the MSX systems and the many VR missions that were released with MGS2. Metal Gear Solid 2 is essentially a tactical espionage game. The aim of the game is to avoid detection while you carry out your missions. A stealth approach is necessary to avoid being seen, if you are spotted by the guards or cameras, you better run and hide or face being killed. Luckily you have a radar that shows you the enemies field of vision and which way they are looking. You can sneak up behind them, break their necks and drag them off to an inconspicuous location. How you choose to play the game is up to you, but evasion is the best tactic. Following in the footsteps of MGS and MGS2, the third installment is set in a Russian Jungle in 1964, two years after the Cuban missile crisis. Instead of the old radar featured in the previous games, though, the player is equipped with sonar and motion sensors. Between them they provide the same info as the old radar, but limited battery life means they must be used sparingly. The jungle setting looks gorgeous, and its clear the game was pushing the creaking PS2 to its limits. But the change of setting from indoors to the great outdoors impacts on the gameplay too. The game is now not just an espionage game but a survival game. Snake, if thats who he really is, has to eat jungle animals to survive and keep his stamina up. He has to be sure to be wearing the right camouflage for the area he is in. Survival is all about keeping fit. Snake must keep himself well fed, and his wounds dressed, or the travails of his mission will take an even greater toll. In structure the game resembles its grandfather most  there are large, spectacular bosses to defeat as there were in the series first iteration. The-cut scenes are even more beautiful than MGS2. And with 20-25 hours of heart-in-mouth sneaking, and as sophisticated a plot as you are likely to find in any game - or even movie - it seems Hideo Kojima really pulled something out of the bag. The gameplay is familiar to those who have played the Metal Gear Solid series before, but with some key advancements that push the action genre to its limit. Not only will you get to control Big Boss and use stealth to accomplish your mission, but you will be in control of your Soldiers Without Borders squad and try your management skills at the same time. If the mash of RPG, action and RTS genres doesn't surprise you, then try this on for size  Peace Walker is optimised for co-operative play. Up to four players can join forces and work together to tackle various objectives. The Co-Op Ring allows you to share items, equipment and life gauges during battle and the Snake Formation sees one player take point while the others defend.